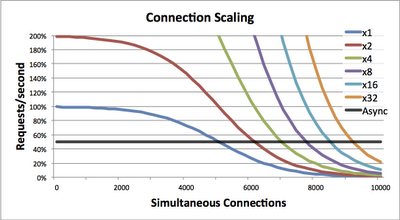 Scalability: it's the question that drives us; it's a systemic anomaly inherent to the programming of the matrix. Few statements troll me better than saying “Nginx is faster than Apache” (referring to the two most popular web-servers). Nginx is certainly an improvement over Apache, but the reason is because it’s more scalable not because it’s faster. 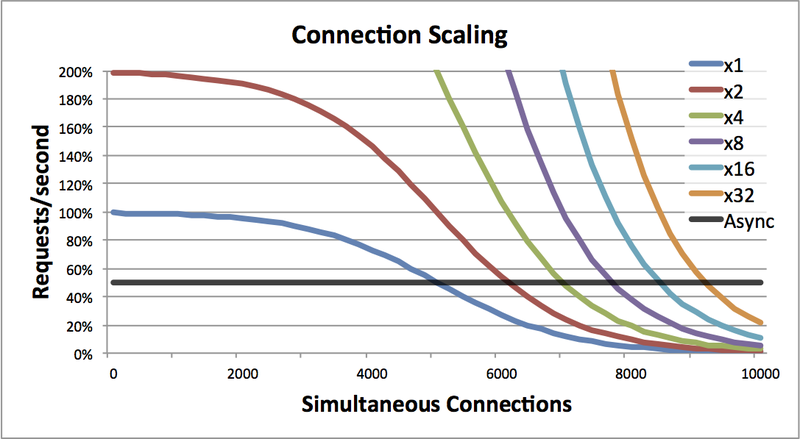 Scalability is about how performance degrades under heavier loads. Sometimes servers simply need twice the performance to handle twice the traffic. Sometimes they need four times the performance. Sometimes no amount of added performance will handle the increase in traffic. 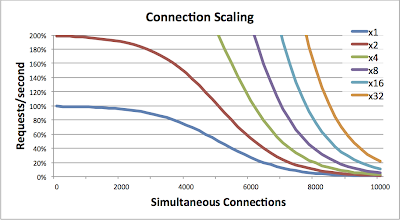 The graph above shows the well-known problem with Apache: it has a limit to the number of simultaneous connections. As the number of connections to the server increases, its ability to handle traffic goes down. With 10,000 simultaneous connections, an Apache server is essentially disabled, unable to service any of the connections. 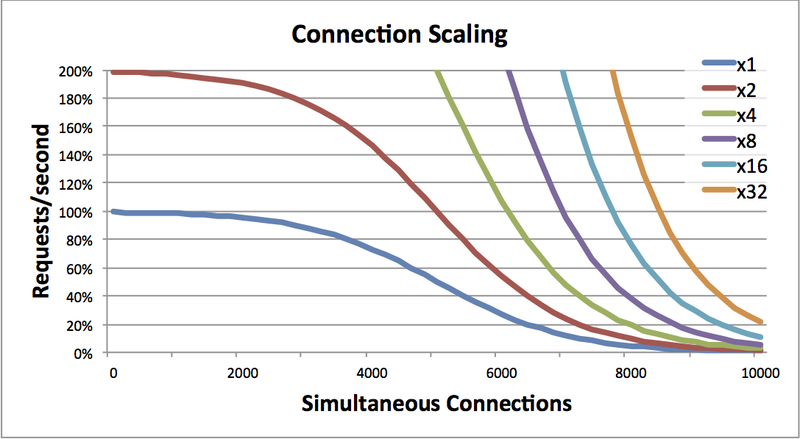 The above graph shows how increasing speed by two, four, eight, sixteen, and even thirty-two times still does not enable Apache to handle 10,000 simultaneous connections. 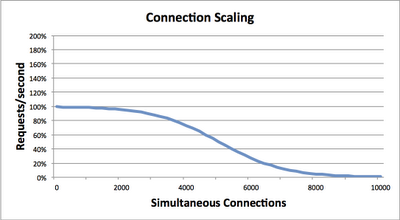 This is why scalability is a magical problem unrelated to performance: more performance just doesn’t fix it. The solution to scalability is like the spoon-boy story from The Matrix. It’s impossible to fix the scalability problem until you realize the truth that it’s you who bends. More hardware won’t fix scalability problems, instead you must change your software. Instead of writing web-apps using Apache’s threads, you need to write web-apps in an “asynchronous” or “event-driven” manner. This graph shows why asynchronous servers seem so magical. Running Nginx or NodeJS on a notebook computer costing $500 will still outperform a $10,000 server running Apache. Sure, the expensive system may be 100 times faster at fewer than 1000 connections, but as connections scale, even a tiny system running Nginx/NodeJS will eventually come out ahead. 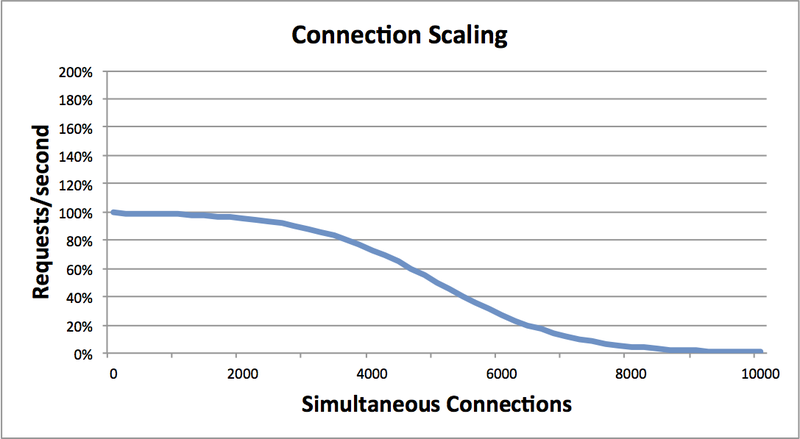 Whereas 10,000 connections is a well-known problem for Apache, systems running Nginx or NodeJS have been scaled to 1-million connections. Other systems (such as my IPS code) scale to 10 million connections on cheap desktop hardware. The purpose of this post is to show you the last graph, demonstrating how asynchronous/event-driven software like Nginx isn’t “faster” than Apache. Instead, this software is more “scalable”. This is one of the blue-pill/red-pill choices for programmers. Choosing the red-pill will teach you an entirely new way of seeing the Internet, allowing you to create scalable solutions that seem unreal to those who chose the blue-pill. I'm sorry but NodeJS has huge issues and will not be able to handle many connections, mainly for other reasons (memory usage etc.). Nginx is a serious server, NodeJS is a hipster toy. It makes me sad to see them equated.